The LifeSize® UVC Video Center™ is the world’s most powerful one-button HD streaming, recording and auto-publishing solution. Capture your critical business decisions. Record your sales meetings, presentations, company updates and training sessions. 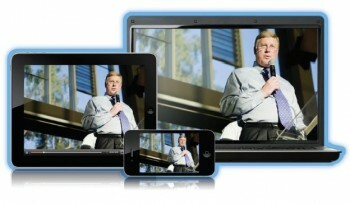 Broadcast your company meeting in HD to employees wherever they are. Stream secure content to tens, hundreds or even thousands of people, live. Post & embed video’s for later viewing via a web browser. All at the single press of a button. Note: Although most of the Lifesize UVC Platform applications have been made end of life, the UVC Video Center is still available for organisations to purchase as a stand-alone application on the platform. With LifeSize UVC Video Center, access to HD-quality video streaming, recording and playback is at your fingertips. At the single press of a button, you can record and publish HD-quality video to thousands of viewers so that they see exactly what you want them to see. Live and on-demand videos are automatically optimized for every viewer—desktop, laptop, tablet or phone—ensuring a quality viewing experience with minimal delays or buffering, even on the smallest devices. The LifeSize UVC Video Center – Share Knowledge and Communicate Business-Critical Information, at Anytime. LifeSize UVC Video Center, now available on the LifeSize® UVC Platform™, supports an unrivaled number of concurrent recordings, on-demand streams and simultaneous live streams, all in 720p30 HD video. With the simple push of a button, you can record and broadcast executive updates, business presentations, sales meetings and training sessions as well as share data, charts and images. Automatic adaptive streaming optimizes live and on-demand videos for every viewer—desktop, laptop, tablet or phone. The viewing device automatically selects the best playback rate based on bandwidth conditions, thus ensuring a quality viewing experience with minimal delays or buffering, even on the smallest devices. LifeSize UVC Video Center enables new applications and scales to thousands of users. Now you can broadcast your monthly meetings to customers and employees around the world, who can watch videos on their computers and mobile devices. A new multicasting feature improves bandwidth utilization for live streaming to large audiences. And a new federation feature offers similar scalability with the added benefit of linking multiple UVC Video Centers across geographic locations, so you can access and share video content without putting strain on the network. Integration with active directory simplifies user and group management, and a built-in reporting feature gives insight into user viewing patterns. In addition, UVC Video Center scales to enterprise needs through support for network storage. UVC Video Center also offers API support for integration with third-party applications, including Learning Management Systems. And you can embed live and recorded videos in websites and social media tools. UVC Video Center offers flexible licensing so you can buy the capacity you need today and scale as you grow, thus ensuring improved utilization of IT resources and dollars. LifeSize UVC Video Center also offers two levels of feature options: a Standard Edition and an enhanced, feature-rich Enterprise Edition. Video conferencing shouldn’t just be about having meetings. It should be about accelerating decision making, sharing ideas, collaborating with the larger team and having fun, productive face-to-face discussions. The applications provided in LifeSize UVC bundles let you do all that and more. Each LifeSize UVC bundle comes packaged with the four core video conferencing applications you need to host a basic video conference call and so much more. There are apps to conduct mobile video conferencing and multiparty calling, to stream and record your meeting and even to manage your video infrastructure. Not only can you collaborate from your PC, Mac or mobile device, but the UVC video conferencing applications were exclusively designed to work in perfect harmony with LifeSize Icon too. Speak to VideoCentric about what is available within the UVC Bundles today. VideoCentric are accredited and fully trained with LifeSize to the highest level, one of only 2 expert partners in the UK. VideoCentric have worked with LifeSize since it was founded in 2003, alongside relationships & accreditations with all the world’s leading video conferencing and collaboration integrators. VideoCentric can and do take an unbiased approach when recommending and designing solutions for customers, ensuring the solution is right for you. VideoCentric have LifeSize Room, Team, Express and Unity endpoints for demonstration in their HQ, alongside the full LifeSize UVC Platform, which can be compared against Cisco, Polycom, Avaya and Vidyo solutions. 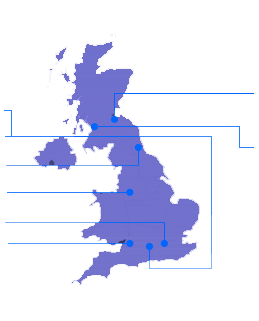 VideoCentric can also demonstrate all of these solutions, and more, at your site and remotely – one of the only UK integrators to be able to provide a full demonstration service of over 40 video conferencing systems nationwide.